The first lasers with the special wavelength of 1318 nm first entered service back in 1995 when Prof. Dr. med. habil. A. Rolle was appointed senior consultant. 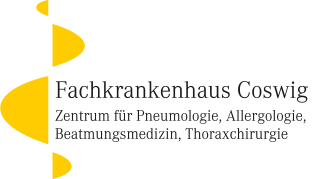 It means that the Coswig pulmonary laser centre was able to celebrate its twentieth anniversary in 2015. On 1 March 2016 Dr. med. S. Drewes took over the post of senior consultant from Prof. Dr. med. habil. Rolle, who entered well-earned retirement and who has been performing his duties in an honorary capacity since then. In the meantime over 3,000 laser operations on the lung have been performed and the thorax clinic has developed into an international laser centre where patients from all over the world come for pulmonary metastases operations. Prof. Dr. med. habil. A. Rolle had carried out research into the 1318 nm wavelength and its specific interaction with the pulmonary tissue and verified its special advantages for pulmonary operations at the University of Munich back in the late eighties. He collaborated with the GSF Research Centre for Environmental Health in Neuherberg to develop the first laser suitable for medical use on the patient. It was based on an Nd: YAG solid state laser, whose main wavelength of 1064 nm was suppressed to emit the second wavelength of 1318 nm with a maximum of 20 Watt power output. Along with a focusing hand piece this output could be optically intensified so that an incision could be made on the lung tissue and at the same time hemostasis performed on the very many vessels surrounding the lung. Just ten years later the Nd:YAG laser technology had been refined to such a degree that the power output could be increased to 40 Watt, this being sufficient to introduce the laser system to routine thoracosurgical practice in 1996. With the aid of industry and the then newly available nanotechnology Prof. Dr. med. habil. A. Rolle was able to make another major development a decade later. He developed a pure diode (semi-conductor) laser which emitted the 1318 nm wavelength up to 150 Watt power output without requiring the high current very problematic for surgery. The medical introduction in 2008 means that laser operations can now be performed in direct contact with the pulmonary tissue 3x faster than previously. This benefits the patient by reducing the surgery time, and benefits the surgeon by greatly simplifying fibre guidance.